Dashfire partner Packback Books is growing like crazy. The ISU-student-founded team of Kasey Gandham, Mike Shannon, and Jessica Tenuta just launched a a full web platform, is making deals with America’s biggest publishers, and closed a deal with notorious billionaire Mark Cuban. It all started with a vision to allow students to use and pay for textbooks when they needed them. The team reached out to Dashfire and quickly built out a plan of action, which successfully launched with hundreds of participating Illinois State students. After initial feedback, Dashfire built out a full vision and roadmap; the team was ready for the big leagues. Packback – digital textbooks for $5 or less from Packback on Vimeo. Kasey and Mike appeared on the March 21st episode, and successfully netted Mark Cuban, receiving $250,000 in exchange for a 20% equity stake. Using Shark Tank as a launch board, the team has since signed deals with huge publishers and got thousands of user signups as a result of the episode airing. Back at home, the Chicago startup community embraced and supported Packback throughout the Shark Tank process. 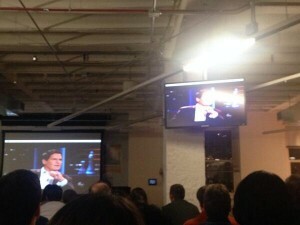 On viewing night, 1871 Chicago hosted a viewing party for Packback at their HQ. Their deal marked a triumph for the Chicago startup community as a whole!